Congressional Democrats are slightly more liberal than their historic norm; congressional Republicans are more conservative than at any other time on record. You can look it up. In venues too numerous and depressing to itemize, we're seeing shutdown-themed standard D.C.-media laments about polarization, dysfunction, failures of leadership, "extremists on both sides," and so on. The chart above, which is well known in the poli-sci world, is important for reality-check purposes. It's from a paper by political scientists at U Georgia, Princeton, UCSD, and NYU -- read all the details here -- who have measured the relative liberalism or conservatism of Democratic and Republican politicians over long historical periods. This chart assesses members of the House through a century-plus of post-Civil War history, from Rutherford B. Hayes's administration through Barack Obama's first term. The bottom three lines on the chart show three measures of Democratic sentiment: for Southerners, Northerners, and the party as a whole. The line at the top is for Republicans. In each party's case, movement toward the center of the chart indicates a move toward the center politically. Republicans are more conservative when their line goes up; Democrats, more liberal when their lines go down. For the Democrats, the chart shows that the party generally moved toward the political center from roughly the 1920s through the 1970s, led by its most conservative group, the Southerners. Since then, the party as a whole has become slightly more liberal, mainly because of the near-disappearance of the "Blue Dog"-style conservative Southern Democratic bloc. And for the Republicans? From roughly Teddy Roosevelt's era through Richard Nixon's, they became slightly more centrist/liberal. 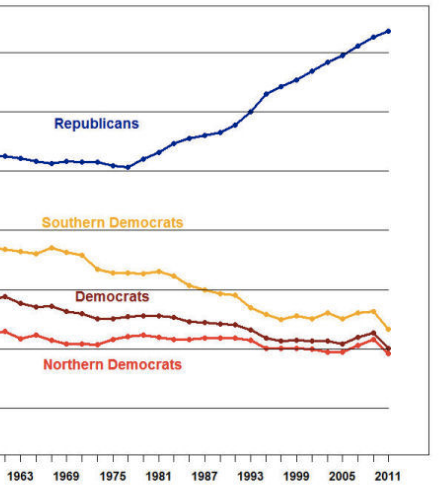 Then starting in the late 1970s -- about the time Nixon's "Southern Strategy" was kicking in, and the South switched from being the Democrats' stronghold to the Republicans' -- House Republicans became dramatically more conservative. Here's the chart showing recent movements. Below is a comparable map of the Senate, which shows roughly the same trend. And the trend is this: in both the House and the Senate, Democrats are slightly more liberal than their historic norm, and Republicans are significantly more conservative than at any other time on record. As I say, everyone in the poli-sci world knows about these graphs and underlying patterns -- for instance, Thomas Mann and Norman Ornstein talked about these studies near the end of their segment yesterday on C-Span. Not enough people in the public or the workaday press seem aware of them. Yes, today's reality is partly a matter of "both parties becoming more polarized." But it is mainly a matter of the dramatic recent shift rightward of the Republicans, especially in the House. Let's look on the bright side! 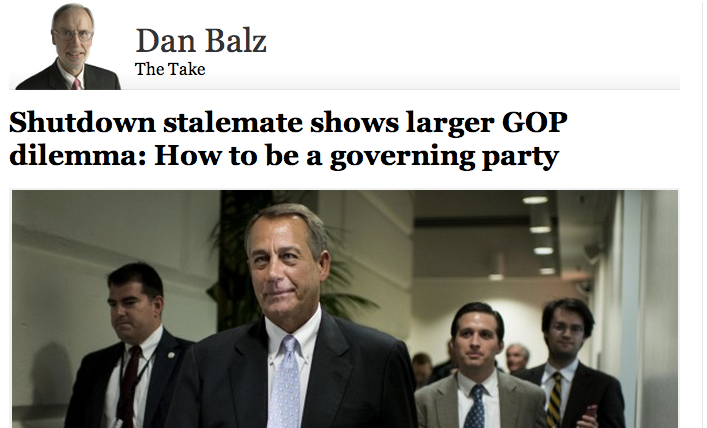 I've been on the warpath about a lot of WaPo stories (and egregious editorials) recently, so let me mention two very good "let's look reality in the face" stories by the estimable Dan Balz, here and here. The headline from the first is below. Also on how the press can grapple with the awkward realities of this moment, see this by political scientist Brendan Nyhan in the Columbia Journalism Review, which gives more context about the poli-sci approach to polarization.